The Greyhound and Whippet Collars shown on this page are manufactured using a traditional design, to fit the unique shape of a greyhound and whippet's slender neck, but are also suitable for dogs with similar shaped necks such as lurchers and longdogs. Ancol's greyhound and whippet collars are made using premium bridle leather that has a consistent grain and thickness, that are tanned with 100% natural fats to help keep the collars soft and supple. Both the whippet and greyhound collars are cut wider in the middle, to avoid them from slipping the collar over their slender heads and help avoid damage from them pulling on the lead, available in two colours black or tan! 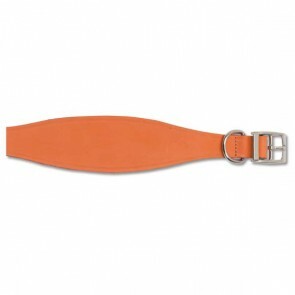 We also stock Round Leather Dog Collars suitable for working dogs and gun dogs, that are reinforced with a nylon core for added strength and shape, in various sizes. 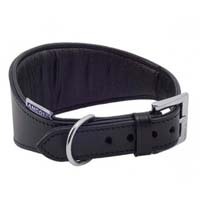 Greyhound & Whippet Collars: 5 stars out of 5 based on 3 user reviews. No hassle delivery. Lovely collar - as described. Would recommend this product. Excellent value. Quick response to email, and telephoned to confirm item dispatched. What more could you ask for!